In this photo, I am tig welding aluminum using a tig-torch and aluminum filler rod. 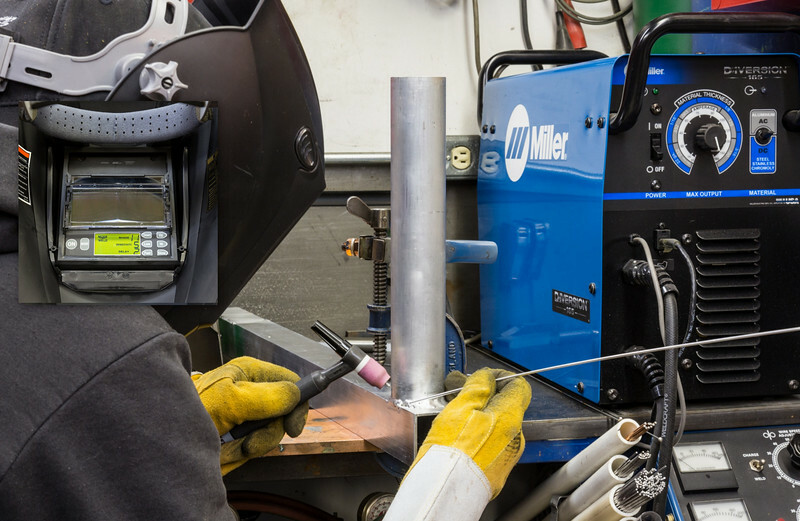 The tig process derives the heat for welding from an electric arc established between a non-consumable tungsten electrode and the part to be welded. I am manually feeding aluminum filler material into the weld puddle, and controlling the amount of amperage required with a foot control. I am using a air-cooled torch (there are water cooled torchs) to hold the tungsten electrode and it is connected to the tIg welder shown on the right (lower welder is a mig welder). The tig welding process also requires an external shielding gas, typically 100% Argon, which is what I am using to protect the molten metal and electrode from atmospheric contamination. Tig welding also has all position welding capability and is excellent on very thin materials. Additionally, a tig welder makes welds that have outstanding appearance ( important for the projects that I build in my machine shop) and clean-up is fast and easy since there is no slag and essentially no spatter. Tig welders and the tig welding process are capable of producing very high quality welds in almost all metals and alloys. I am using a gas lens on my tig-torch, which consists of an enhanced collet body that holds the tungsten, constructed of a series of concentric layered screens of varying mesh engineered to improve shield gas coverage. The screens generate a laminar gas flow optimizing the weld zone coverage and eliminating turbulence which can draw in contaminants from the surrounding air, crucial in welding aluminum. I am using an Miller Digital Elite auto-darkening welding helmet, and it makes welding a joy. Here are some of the features of this welding helmet.